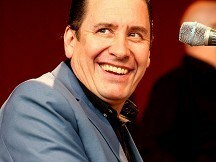 Jools Holland has been hailed as a "national treasure" by the Prince of Wales. The piano player, big band leader and TV host has been honoured with a gong for outstanding contribution to music and music broadcasting over three decades. Prince Charles said in a video message: "I'm so sorry to surprise you in this rather disembodied way but I just want to add my own heartfelt congratulations to your official promotion to the ranks of the great and good. "As you now know there has been a long-running plot to promote you to the position of a full blown national treasure. "You are the very embodiment of that rare species and so many people's lives have been enhanced not only by your irresistible music but also by your wonderful humanity." Sir Elton John, Bob Geldof, Ringo Starr, The Rolling Stones, Eric Clapton, George Martin, Sting and Chrissie Hynde were also among those who sent messages as Jools received the Music Industry Trusts Award. Jools was presented with the award by friend and comedy star Jennifer Saunders at a charity event at London's Grosvenor House Hotel in aid of Nordoff Robbins and The BRIT Performing Arts & Technology School.